We’ll be glued to our seat at the American Airlines Center most of the weekend so we don’t miss any of the action, but here’s what you don’t want to miss outside of the arena. Upon your exit from Dallas/Fort Worth International Airport or Dallas LoveField Airport, the Dallas Area Rapid Transit (DART) gets you around Dallas with modern public transit services and customer facilities tailored to make your trip quick and easy. Local, single ride day fares start at $2.50. Need a lift further into the city? D-Link, DART’s free bus service, can get you from Downtown to the Bishop Arts District, while the McKinney Avenue Trolley connects Uptown to Downtown and offers a free, quick ride to restaurants, pubs and shops along the way. Or hop on EFrogs, a free golf cart-style shuttle service, to get you to your next stop. The Dallas Arts District is the largest urban arts district in the United States, spread over 20 square blocks and encompassing 68 acres, this walkable downtown hub of creativity features art with award-winning museums, performing arts venues, restaurants and bars. Deep Ellum is a trendy and hip area of modern Dallas, and the headquarters for live music – a great district to explore at night. The Bishop Arts District is home to more than 60 boutiques, restaurants, bars, coffee shops and galleries, making it one of Dallas’ most unique districts. 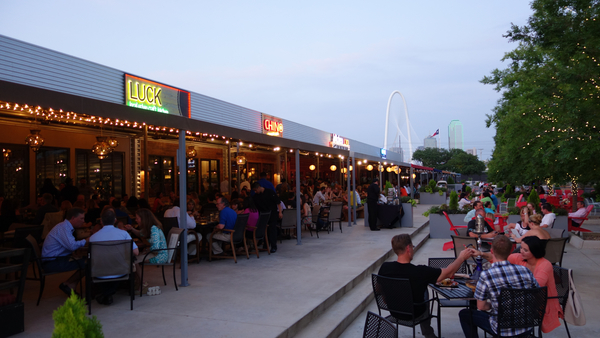 Trinity Groves is a 15-acre restaurant, retail, artist and entertainment destination that sits at the base of the Margaret Hunt Hill Bridge in West Dallas. Pay a visit to a brewery, culinary events center and multiple restaurants. Purchase your Dallas CityPASS online for easy access and discounted admission to some of our most popular attractions. By buying your CityPASS ahead of time, you’ll skip the ticket line and go right in at six of Dallas’ most exciting attractions, which means more time for your BIG adventures. Need some ideas on where to start? Stop by the Visitor’s Center Downtown! Pick up a map or get a recommendation on the best things to do in Dallas. Explore Klyde Warren Park, an urban green space with food trucks and daily activities, over a bustling highway in the heart of Downtown. Main Street Garden, Belo Garden and Sammons Park are other enchanting local favorites to enjoy on a sunny afternoon. Start in the West End Historic District and get a glimpse of 1960s Dallas as you walk amongst century-old brick warehouses, now home to dozens of shops and restaurants. The nearby Dealey Plaza was the site of President John F. Kennedy’s assassination and is one of the most visited spots in Dallas.